Dysfunctions in the body’s immune system result from inherited conditions, from bacteria or viruses, or in situations where the immune system begins to attack normal body cells, resulting in an autoimmune disease. Part I: Immune System Overview describes how the immune system works and explains both natural and acquired immunity. 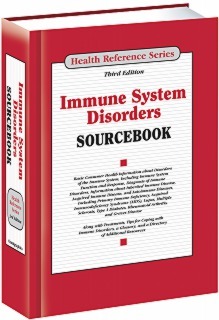 It summarizes the types of disorders that affect the immune system and describes factors that influence its function. Research initiatives to help better understand the immune system and learn how it can be manipulated to produce health benefits are also described. Part II: Diagnosis of Immune System Disorders provides information for people concerned about the diagnostic challenges involved in identifying immune disorders. Facts about the tests most commonly used, including blood, gene, and allergy tests, are provided. Part III: Inherited Immune Deficiency Diseases explains the symptoms, diagnosis, and treatment of diseases that result when genetic defects cause essential parts of the immune system to be missing or to malfunction. Inherited immune deficiency diseases include primary immune deficiency (PID), ataxia-telangiectasia, selective IgA deficiency, and severe combined immunodeficiency (SCID), which is more commonly known as bubble boy disease. Part IV: Acquired Immune Deficiency Diseases describes immune system diseases that are not present at birth but that are acquired later. These can result from exposure to the human immunodeficiency virus (HIV), the body’s response to a transplant, or the inability to tolerate a substance in the environment. Part V: Autoimmune Diseases explains the symptoms, diagnosis, and treatment of diseases caused when immune cells mistake the body’s own cells as invaders and attack them. Individual chapters cover diseases alphabetically from Addison disease to vitiligo. Part VI: Other Altered Immune Responses describes immune system reactions to environmental triggers and medical treatments. Topics include allergies and asthma, serum sickness, blood transfusion reaction, transplant rejection, and anaphylaxis. Part VII: Treatments for Immune Deficiencies and Diseases contains information about drug and gene therapies, plasmapheresis, stem cell transplantation, and immunotherapy. Treatments used for specific immune diseases are also described. Part VIII: Coping with Immune Disease provides tips for individuals and families living with an autoimmune or immune system disease, including facts for caregivers, immunization recommendations, and suggestions for students and travelers with immune system disorders. Part IX: Additional Help and Information offers glossaries of immune system terms and autoimmune diseases and a directory of resources.